In Childhood Asthma: Part I, I presented ways in which Asthma can present and exactly what was the nature of the disease. Today we will deal with the diagnosis and various means of treating asthma. Asthma may present in early infancy but is very difficult to diagnose for the reasons mentioned in part one. 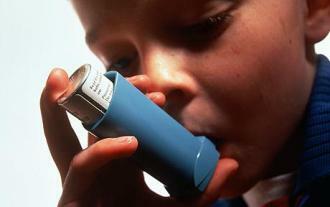 Also the signs and symptoms of asthma in the very young child can be caused by many other issues. So it is when the symptoms are very severe or they continue beyond two to four years of age that one begins to suspect asthma. Let’s assume for the purpose of this article that all the other causes have been ruled out and that it appears that your child indeed has asthma. The first thing to realize is that the symptoms may vary from very severe to extremely mild requiring daily close control or only occasional use of medications and treatments to keep your child comfortable and active. The goal in treatment is twofold: first to allow your child to remain active, socially oriented, and happy. The second is to prevent the permanent secondary changes in the lungs from longstanding uncontrolled asthma. Early in the course of treatment, a child who presented to the emergency room or physician’s office with symptoms of acute asthma usually needed to be admitted to the hospital for a few days in order to get the symptoms controlled. As time went on, newer systems such as nebulizer treatments that could be performed at home were implemented and admissions to hospitals dramatically diminished. Today it is not uncommon at all to see a nebulizer machine in the home of a child with asthma. The other issues that were improved upon were the level of education of a family in which there is a child with asthma, and the greatly improved medications available to treat asthmatic symptoms with fewer side effects and greater efficiency. As more becomes known about asthma, through research and observation, the efficiency of treatments increases dramatically. Since we know from the previous article that the underlying problems causing symptoms of asthma are related to constriction of the small airways, mucus production and inflammation, there was a body of research that tried to find out which of these causes were more important, and which specific medications could be used for each symptom. At one point or another each of them were implicated but recently the inflammatory process seems to be very important. Also inhaled medications seemed to give the best results without some of the bothersome side effects, both long term and short term. With the development of better mobile delivery systems for these medications and the increase in knowledge that families now have about the disease, the disease can now be managed very efficiently at home. Fewer and fewer hospitalizations have been the result with a greatly decreased cost of delivering medical care to these children. Your Doctor is very familiar with the armamentarium of medications available to use for children with various degrees of the disease. The two main issues with the treatment of asthma is the immediate treatment of the acute problem, breathing difficulty, and then the long term control of the recurrence of those symptoms. There are many medications, or combinations of medications, available to gain and maintain control over the symptoms of asthma and your child should be able to live a perfectly normal life style. You as parents will shortly become, with the help of your Doctor, the “expert” when it comes to asthma in your child. Shame Nation: Choose To Be Part Of "The Solution"
Do You Know Your Family's Asthma Triggers?